From skiing and snowboarding at nearby Mount Bachelor to our on-site ice skating rink and heated outdoor pools, Seventh Mountain Resort can easily serve as your home base for winter fun in Central Oregon. Situated in the Deschutes National Forest, just minutes from downtown Bend, Oregon, this impressive resort is the closest lodging to Mount Bachelor ski area. Enjoy easy access to downhill and cross-country skiing, snowboarding, snowshoeing and all the Cascade Mountains have to offer. Take the family tubing, ice skating or just relax in our outdoor hot tub after a hard day on the slopes. Whatever your pleasure, take on the winter season at this exceptional Central Oregon resort, offering occasions to make memories to last a lifetime. 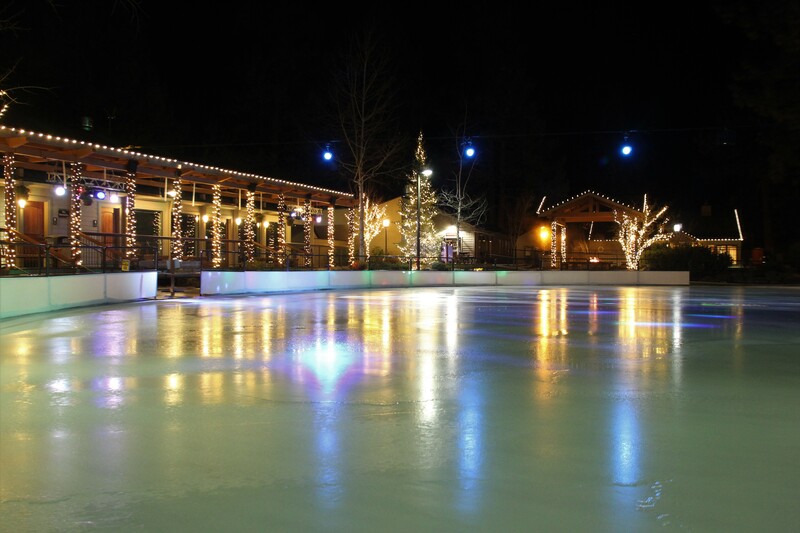 Ice skating, An outdoor rink is located in the center of the resort and open to the public. Skiing, and snowboarding at nearby Mount Bachelor. Check out our Ski & Stay Packages here. Nordic skiing and Snowshoeing opportunities are available on nearby Deschutes National Forest trails and at Mt Bachelor. Sled-Dog Rides, a wild, magical experience! Stay snug and warm in the sled while the team, along with a professional musher, takes you on an exciting adventure. Snowmobiling, with professional guides through Central Oregon Adventures. Ice skate sharpening ($12/pair, $20 for new skates) at the resort’s Adventure Center.